When it comes to packing food for the backcountry, protecting essential gear from moisture, or entombing a biohazard pair of smelly socks, there’s one item that does it all: Ziploc Freezer Bags. Ziploc is the brand name product line from SC Johnson. Zip-lock bags are from any of its myriad competitors. In my experience, they all work fine provided you purchase the versions designed for freezer storage. Why? They’re thicker than your average sandwich bag, which averages 1.5 mil in thickness (a mil is 1/1000th of an inch). 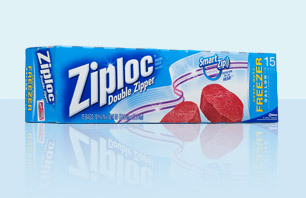 Most freezer bags are at least 2 mil; Ziploc brand freezer bags are some of the thickest at 2.7 mil. This increased thickness translates to greatly enhanced durability, a key feature if you’ll be stuffing and unstuffing them repeatedly from your pack. What’s more, a thickness of 2 mil or more allows manufacturers to produce the closure strip at the same time the bag is produced. On thinner sandwich bags, the closure strip has to be laminated on (and can potentially peel off with repeated use). In terms of the type of closure system, I prefer the classic design (pinch the closure system with your fingers and thumb and slide across to seal it closed). It is the least expensive style and has proven much more durable with repeated use. Some designs feature a slider tab that makes closure quick and easy. Convenience is good, but in my experience it can be hard to get a fully airtight seal with these (especially with repeated use) and the tab can sometimes pop off or come loose, in which case the bag is essentially shot with no way to close it. Finally, consider double-bagging your food if it will be put through extreme abuse (like being stuffed and restuffed into a bear canister) or if a significant amount of material will leak out through even a small hole (hot chocolate powder, etc.). I usually purchase the gallon size bags for maximum versatility. Smaller pint- and quart-sized bags are also available if you prefer a smaller option for your packing needs.